This time it doesn't include any new content or features, but it introduces incredibly important technical change - and that is full support for localization! We will provide the localization tool for making unofficial localizations soon (we need to decide which languages will receive official localization). - Full localization support. Now any part of the game can be translated into other languages. This includes both: game content and any UI elements. - You can now change key binding to open developer console. - Increased distance for weapon shot and hit sounds as well as destruction sounds. - Pain doesn't prevent health regeneration now. - Implemented tooltip show delay to make UI less noisy when you move the cursor over multiple item slots, etc. - Added additional checks to make sure "respawn near your bed" cannot respawn you in a location that is not suitable (e.g. rad towns, water, etc.). - Made sure oil/Li spots wouldn't spawn too close to players' land claims. - Accurate running animation speed. - General performance and quality improvements. - Fixed performance degradation with item tooltips after several hours related to item tooltips (thanks @PanBanan, @KaypeX). - Fixed radiation and heat post-effects screen noise. - If you have any compilation errors on launch - please disable any mods you have installed. You could also contact mod authors to ask them to update their mods to the latest specification defined in A19. Game discussion / Is hacking/cheating possible in CryoFall? 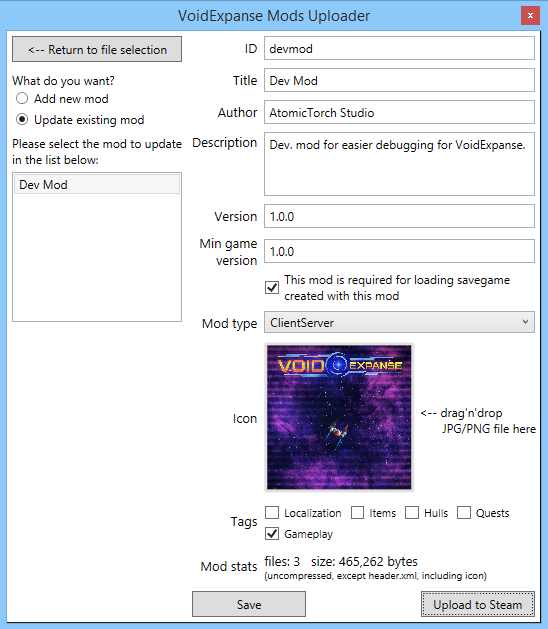 You can develop mods by using Client or Server, but we suggest to use CryoFall Editor as it including both Client and Server in a single executable (and some other awesome developer features as well)! If you own the game on Steam you can download CryoFall Editor from Steam. If you have an atomictorch.com account and own the game you could download CryoFall Editor from My Games and Items page. Install Visual Studio 2017 (any edition, including free Community edition). Enable .NET desktop development, but before continuing installation, please ensure that you've checked ".NET Framework 4.7.1 targeting pack". If you already have VS2017 installed, please launch Visual Studio Installer -> Modify -> Individual components—and ensure that ".NET Framework 4.7.1 targeting pack" is checked and installed. Extract <game folder>/Core/Core.cpk archive file - you can do this by executing a CMD script located in the same folder. If you prefer to extract it manually (it's a simple Zip archive), please delete the original file after extraction and rename the extracted folder to "Core.cpk". After that, you can open the game solution file with VS2017. It's located in <game folder>/Core/Core.cpk/. The CryoFall custom game engine (called Renkei) supports live reloading of C# & XAML code (as well as all the visual and audio assets) so it's not necessary to restart the game to observe the changes! XAML Designer is not supported (though it can work fine in most cases) and it's recommended to disable it (Visual Studio Options, XAML designer, uncheck "Enable XAML Designer"). If you want to debug your code with breakpoints, please go to Visual Studio Options, Debugging, uncheck "Require source files to exactly match the original version" (because the game includes C# compiler which performs some code-generation and so resulting C# files do not match the original C# files - but it's not a problem for step-by-step debugging as the C# code lines kept intact). If you're intending to make just a customized game server (custom rates, etc) and don't want to produce any mods, please follow this guide. A few players asked me why we decided to use 2D character art with only 2 views (front and back + mirroring). All player characters should have distinct appearance, so players can easily distinguish between them in the game. The characters should have configurable faces constructed from multiple parts (face "shape", upper and lower face parts, hair, skin, color, etc.). The character faces should always be as visible as possible. For example, if the game was top-down we would never be able to see the characters faces, and in isometric view, players would only see really small faces without much details and without much customization). All the clothing and equipment should be visible on the character (and it shouldn't be simple recoloring or texture swaps). It should be relatively easy to add new content into the game - including faces, clothing, equipment, etc. Let me reiterate - it must be so easy that even modders who are not artists should be able to throw something together in Paint. It should be relatively easy to animate characters. The resulting assets file sizes should be reasonably compact. This will require modeling of the characters, clothing, equipment and even hair. In some cases, it will be possible to reuse the models and just redraw textures, however drawing textures in unwrapped view is hard. The projection will be 3D isometric or similar and players will not see much of the details in face styles and equipment. Animating 3D models is also really hard and requires special (quite complex for novice modders) applications. It's hard to match the style of other (2D) art in the game - buildings, terrain, etc. And it's plainly difficult to integrate 3D rendering with 2D rendering from the programming point of view. Good thing - it allows more views/directions and smoother transitions between them. Obviously, it has all the drawbacks of the previous solution PLUS it doesn't satisfy size requirements as it will require hell lot of images (many frames multiplied on many views multiplied on many different clothes and equipment). This is the chosen solution, completely satisfying all our requirements! The only drawback is that the amount of views/directions is very limited, but it's an acceptable compromise - we've tried hard to keep it looking stylized and fun. With this solution, it's very easy to add new content into the game. You just need to draw a bunch of sprites to add a completely unique face style, clothing or equipment item into the game. You can even use Paint, but we recommend using Photoshop and our special Photoshop template and export scripts (which we will make available later). The game itself is able to automatically reload ANY changed image file and so you can draw-save-try-redraw-save as long as you want and check how it looks in the game. No! Our animation engine actually allows for much smoother animations and sprite mesh deformations, so you can expect much better animations in the future when we can set aside couple of months specifically for this task. We will come back to that in a year or so and hopefully make our character system even better. Currently VoidExpanse should work fine on Ubuntu, Fedora and SteamOS. 3. cannot launch the game (especially on quiGPUs). -force-opengl It will force the Unity engine to use old OpenGL2 renderer (which is in some cases more reliable). 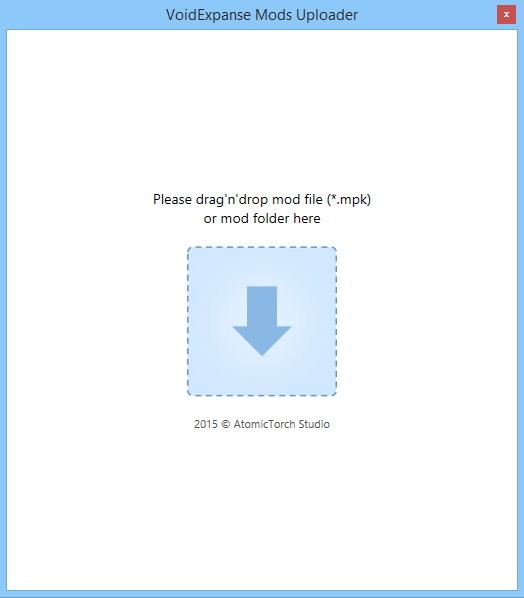 If you still have the issues, please upload your Player.log file from the folder "~/.config/unity3d/AtomicTorchStudio/VoidExpanse/" at http://pastebin.com/ and share the link. VoidExpanse v1.1.8 introduced the color blind modes. The options is described in our blog. I'm glad we have finally fixed the performance issue with the Forums. Hope it will increase the users feedback rate. EDIT. Just to be clear - it's 100 times faster now! As you know, we're going for vacation before Steam release. But work didn't stop and we will do some other tasks, for which we usually don't have time. 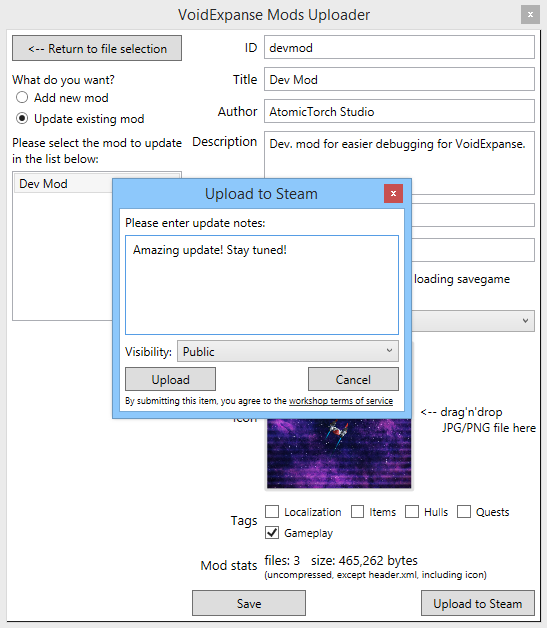 Now we want you to have a look on the shiny new Steam Mod Uploading tool and tell us what do you think about it. Currently it's Windows-only (XP/7/8/10), but of course we will port it on Linux and Mac if we get big community using these platforms. It's not too hard, as the tool is developed taking into account Linux & Mac systems.